Rich soil enriched with plenty of compost. Mix a balanced organic fertilizer into the soil before planting cotton. In midsummer when flowering begins, topdress with more fertilizer or drench with a liquid plant food. Basil, Garlic, Cilantro, Mint, Sage, Dill, Onion, Onions and Sunflower. Sow directly when the soil is warm. In cooler climates start seed indoors and transplant out after the last frost, being careful not to disturb the roots. Water very well before planting. 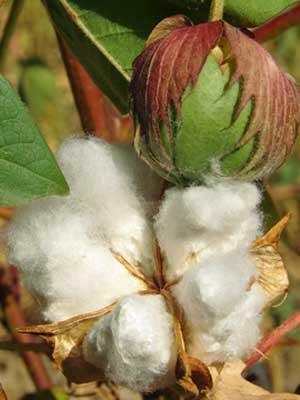 Cotton thrives on heat, but does not respond well to overwatering. In cool climates, grow individual cotton plants in large, dark-colored containers to increase root warmth. Harvest after bolls split open, during a period of dry weather. Cut cotton on long stems and dry in bunches, like herbs. Night-flying beetles often chew holes in cotton leaves, but this problem is mostly cosmetic.